The Dickinson/Iron Medical Care Access Coalition (DIMCAC) is a non-profit 501c (3) organization that serves the Dickinson County and Iron County areas as a community resource. 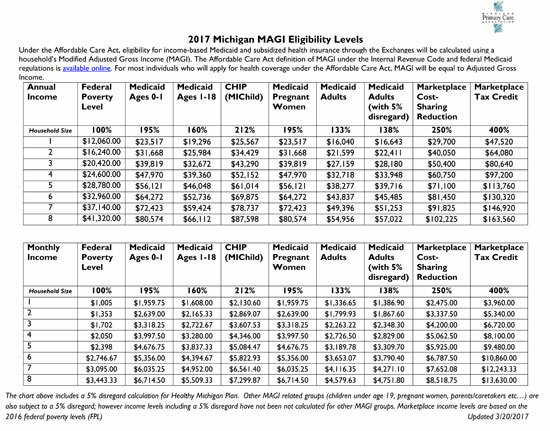 Our program has staff in both counties who are trained to assist residents in applying for Medical Assistance in the State of Michigan.If you are interested in applying for Medicaid or Healthy Michigan, the chart below illustrates eligibility. If your household income falls under the guidelines below, you may qualify for coverage through the State of Michigan. Our staff is also trained to assist residents and small business owners with enrolling into health insurance plans that are offered through the Federal Marketplace that can be found on www.healthcare.gov.If you are a small business owner that is interested in offering a health plan for your employees or if you are an individual that would like to get connected to a Marketplace Insurance Health Plan for yourself or your family, please call the DIMCAC office to see how one of our Certified Navigators can help you. Our services are free of charge but we appreciate appointments. MCAC staff are Certified Medicare Counselors. We are MMAP Counselors which stands for Michigan Medicare/Medicaid Assistance Program. Let us help you with your Medicare questions and/or let us screen you for financial assistance programs available. We also have a “help fund” in which we assist residents with medical, dental and vision services not covered by insurance or any other entity. Contact DIMCAC to fill out an application and see if you qualify! Our “help fund” is partially funded by the United Way of Dickinson County! Click chart below for PDF file.